In a one to one ratio Calcium & Magnesium are two of the most essential minerals. They are vital for maintaining healthy bone density, relaxation of muscles and many other functions. 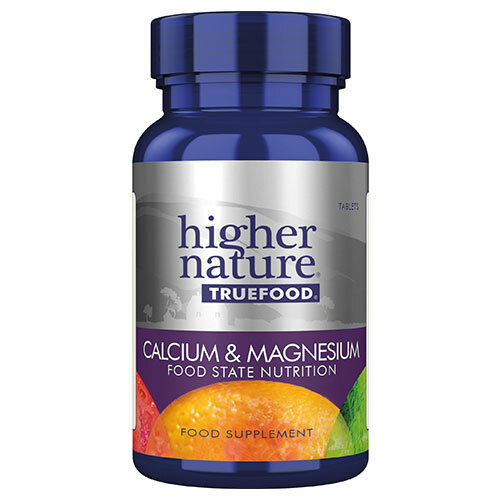 This calcium and magnesium formula provides equal amounts of both minerals from highly bio-available True Food cultures and Sea Calcium seaweed complex (Lithothamnion calcarea). As a guide, much less True Food Calcium & Magnesium is needed than from standard inorganic calcium and magnesium supplements. Proprietary mixture: magnesium chloride, calcium chloride with enzyme digested Saccharomyces cerevisiae (with soya); natural Lithothamnion calcarea, bulking agent: microcrystalline cellulose; bulking agent: hydroxypropyl cellulose; anti-caking agent: stearic acid; anti-caking agent: silicon dioxide; coating: methylcellulose, glycerine, natural vanilla flavour (agave syrup; flavour: vanilla extract; colour: caramel). Adults: Take 2-6 tablets a day, with or between meals, or as your health professional advises. Children over 8 years: Take 1-3 tablets a day, with or between meals, or as your health professional advises. Below are reviews of True Food Calcium & Magnesium - 120 Tablets by bodykind customers. If you have tried this product we'd love to hear what you think so please leave a review.